Twelve of us caught the 7 o?clock ferry to Arran, we were meeting Linda over there. The weather looked promising and we were all in good spirits as we had coffees on the boat. Once there we all managed to get on the bus even though it was bursting at the seams with walkers, golfers and nine dogs. We got off the bus at North Glen Sannox car park and were delighted by the clear blue sky and bright sunshine, which gave us great views of the Arran hills and ridges. We followed a path for about 2 km then a narrow track up to Sail an Im. We continued on path round Creag Dubh and Carn Mor before heading up to Casteal Abhail. There was a fair bit of scrambling but nothing too difficult. We seemed to be going at a fair pace, either Kathryn was on a mission or the guys were wanting back to pub for the football. 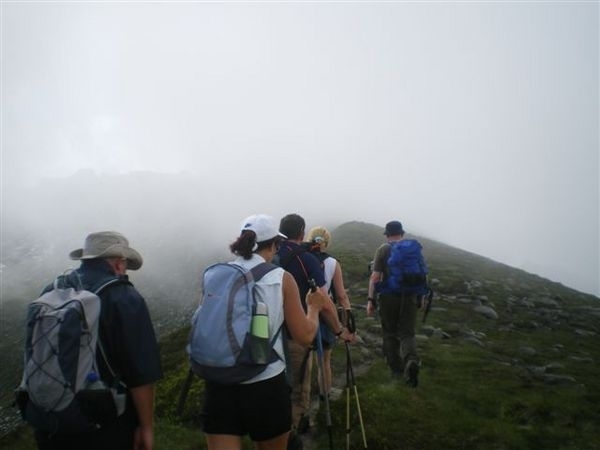 Just as we reached the summit a big grey cloud settled over us and made it quite grey and atmospheric. At this point some of us had to put our jackets on for about 15 minutes, we didn?t need them again all day. 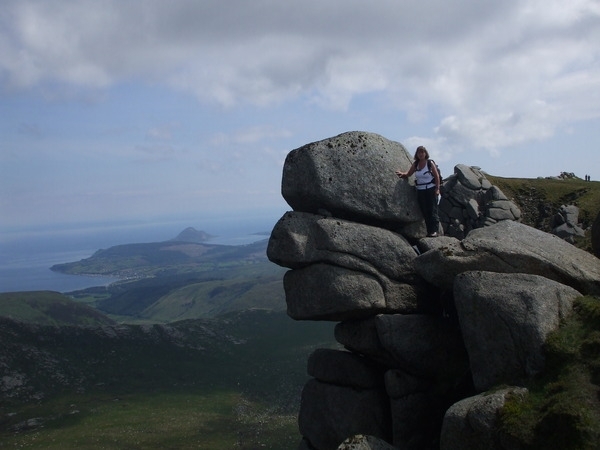 After a short snack break we headed along the path towards Cir Mhor, the views were stunning. Now rumour spread that there is only room for about 5 or 6 at the top, and as there was 13 of us it was every man for himself as we scrambled our way to the summit. We all managed to find a wee nook or cranny to perch on and Phil even managed to have a sleep. I always said he could sleep on the edge of a knife, it?s now official he can sleep on the edge of a cliff. Another snack and a good look at the fantastic views of all the nearby hills and rock formations and then we headed back down to the low point using the same route we had taken up. We took the path that skirted round the back of the A Chir ridge and up to the bealach. At this point Jacqui had to make a decision whether to go on or not. She had twisted her ankle and it was rather painful but with the West Highland Way only a couple of weeks away she decided not to push it too far. Jacqui and Irene headed along the eroded narrow path to Beinn a?Chliabhain while the rest of us headed up Beinn Tarsuinn. A glimpse of Beinn Tarsiunn make it look quite foreboding & I wished that I had volunteered to with Irene and Jacqui. We carried on relentlessly at a fair pace; there was a fair amount of scrambling to get to this summit as well. Some of us girls are on the short side and had to use all fours at times. Today as I write this I am suffering, my arms, shoulders, thighs and even my buttocks are sore. Every pull, tug and crawl has left its painful mark. It was all worth it though! When we reached the summit we had another snack and a good rest. We took our group photo and Linda who lives on Arran pointed out and named all the views ?Campbeltown, Mull of Kintyre and Paps of Jura. 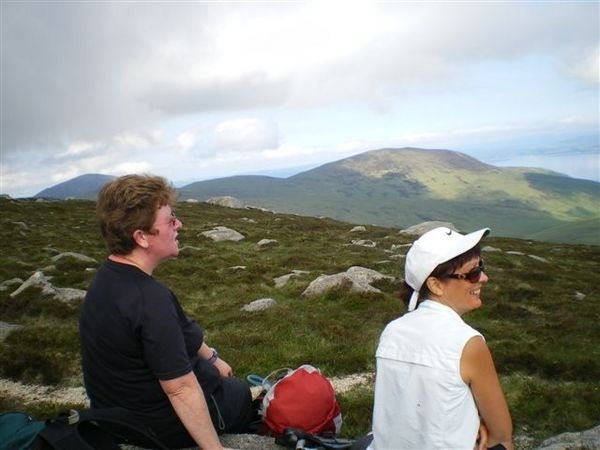 We could even see Irene and Jacqui who were on the path going down to Glen Rosa, we called out and waved like mad, I gave a quick burst of YMCA and they sang back!!! Reluctantly we got on our way again heading to the last summit of the day, Beinn Nuis. From Beinn Tarsuinn it looked quite small and easy but as we started to climb we realised it was quite steep but nothing compared to the last three. In quite good time we got to the top, had a short break an made our return plans, Linda had left her car at Glen Rosa and she and Michael would take turns of ferrying us back to Brodick, how good was that. It was quite hard going on the way down, steep and tussocky. We were getting tired and a few of us had run out of water so we had to refill at the river. Unknown to us ? Maureen had fell in here just 5 minutes ago, but luckily Jim was on hand to help her out. A club trip wouldn?t be the same if Maureen didn?t wet her pants!!! We finally reached the car park and our lift back to Brodick where we had time for a few well-earned drinks before catching the 7.20 ferry home. We had a fantastic day and all the aches and pains are just part of the fun.